I’ve essentially only had 3 hobbies: computers, golf and SCUBA. The latter is quite a bit hard to maintain living in a land-locked state in the desert. The second (golf), however, is very easy to maintain, but long past are the days of free golf that I used to enjoy while working at a golf course and being a part of golf teams. I now have to actually pay for it :-) -- and sometimes it isn’t a priority to want to go out in 120 degree weather and play golf (although that’s usually when my friends and I go). Computers has been the easiest as it has also been my profession. That’s not a good mix because it is hard not to “work” when your profession and your hobby are the same. It’s caused conflict at home a few times and I’ve been remarkably surprised lately how I’ve been able to separate home and work (while working at home). It isn’t easy but I’m getting better. So that’s it. That’s all my hobbies have ever been. Pretty sad? I don’t know…they’re fun and have kept me busy. But this year I decided to diversify and start something new. Most of this inspiration comes from my wife doing pretty much everything she desires these days: biking, swimming, triathlons, kayaking, photography. She’s driven. She decides on doing something and never slows down. I realized that I needed to grab some of her passion. I was sitting around cleaning house a few months back and saw something in our front room (we call it the ‘front’ room because not a single piece of furniture has ever been in there other than our piano – so it isn’t really a family/living room or anything else) that has been nagging at me…a guitar case. 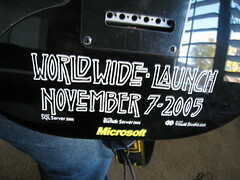 A few years back during the Visual Studio 2005 launch the theme was “rock the launch” for the events around the US. Grabbing on to that theme I was a part of a team that engaged one of our customers, Fender, to create custom guitars with the launch theme. Fender was incredibly awesome to deal with and even decided to try out their new body style at the time along with their new printing process for our project. It was pretty cool to see our design basically make it to a giant guitar inkjet printer and on to an American Stratocaster guitar. We made several of these commemorative guitars for the events for prizes and some also hang on Microsoft facilities in the western US offices. The back of the guitar has some of the commemoration of the event/year as you can see in the photo here. Interfacing with Fender for the project and working through some of the kinks in the new printing process, I was fortunate to be able to have one of the test run units which has been sitting in my room for 3 years. I don’t know anything about music and have no skills in that area at all. My wife is an excellent piano player and my 6-year old daughter is also now playing the piano. I said to myself I either need to give this to someone who will appreciate it more than the case, or I need to learn how to play it! I decided on the latter. I have been taking lessons for about 2 months now and loving it. My teacher is great and very kind as I’m not-so-kind on his ears. It has opened up a new world to me and is quite a challenge, more than any of my other hobbies. The geek in me is never satisfied though so I’ve introduced some technology into the mix. 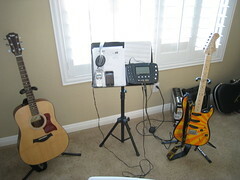 I found a great deal (ebay refirb) on an M-Audio Black Box, which has now been serving as my practice amp since I got it. It definitely isn’t as sophisticated or cool as some others I’ve seen from some friends like Jason Mauer, but for the price I got a USB interface amp modeling device and a pedal (for which I have no idea yet what to do with of course). I also have been using the piece of software on my Mac that has been completely useless to me until now: Garageband. It took me a few minutes to figure out that I needed to change settings in a few different places for the Black Box to be recognized. Now that it is, it’s a helpful learning aid to me as I can record my practices and review them later (as well as record the good ones for my teacher!). It’s been a lot of fun learning to play. This holiday I had hoped Santa was going to bring me a brand new Gretsch Brian Setzer Black Phoenix, but he must not have got my letter in time. Probably a good thing since that is a hefty investment for him to make on a beginner. I’m still determined though to get one, but will wait a while. I did, however, decide to experiment with an acoustic guitar. After some research I settled on Taylor as a great brand and then of course wanted the sweetest model 914e to add to my collection. Again, totally impractical for a beginner. But the research I did do found reviews that said the 110 model was a great guitar and an excellent entry-model for Taylor. I headed down to my local music shop, Milano Music, and found that they had the 110e model in stock and on sale. I played with it for a while and loved it…so I walked out with a new guitar. Here’s my current crappy setup (I need to move them into a room so the kids don’t ruin them) in the picture (click on it for a larger pic). Like I said, this has been a lot of fun – and addicting. I hope to keep it up and get better every week. I’ve been learning the basic 12-bar blues, Cream’s Sunshing of your Love, Neil Young’s Heart of Gold and I also present you with my first recording: Happy Birthday. Maybe I’ll escalate from there :-). It has been real refreshing to take a break from immersion in technologies like Silverlight and .NET and learn something completely new and challenging…I highly recommend it!